It was another tidy victory for Raging Storm tonight, but something was missing. 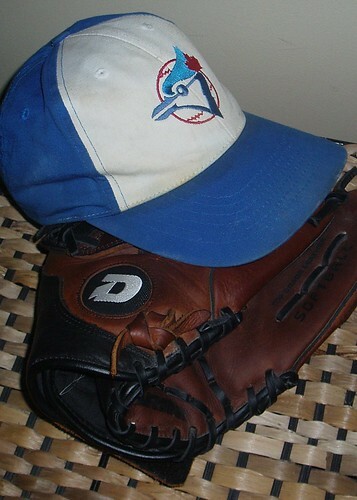 For the first time in many seasons, I didn't wear my retro Blue Jays logo cap and wore a Maple Leafs cap instead. I blame Taryn. Following last Monday's game, I asked her if she'd be able to wash it. She said she would and I haven't seen it since. Tonight, as I prepared for the game, my Jays cap was nowhere to be found. The Leafs cap was an emergency choice. Samson's strength was tied to his hair and mine is tied to my Jays cap. Now where the hell is it? I bet she sold it to a Redsox fan. Can you say....O FOR!! Sorry Boon, I know that hurts...it hurts real deep!! I made up for the 0-3 with stellar defence and a big RBI. When I find my hat, I'll return to my .976 batting average.